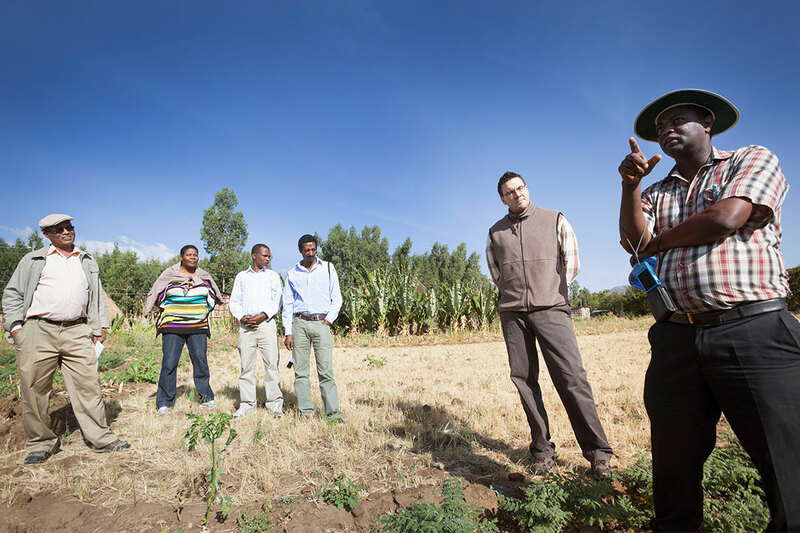 Sheleme Beyene from Hawassa University (left) and Carol Henry of the University of Saskatchewan (second from left) listen with colleagues to Molla Assefa from Hawassa University (right) in a pulse crop field in southern Ethiopia. SASKATOON – A celebration of a 20-year partnership using pulse crops and education to combat child malnutrition and increase farmer incomes for thousands in Ethiopia is bringing together international researchers and dignitaries on May 25 and 26 at the University of Saskatchewan (U of S). The event, entitled “Celebrating 20 Years of Empowering Ethiopia’s Healthy Future through an Ethiopian-Canadian Partnership in Global Agriculture and Nutrition” marks the success of an ambitious program. It is based upon promotion of pulse production and consumption, adoption of improved pulse varieties and agronomic practices, new processing technologies, nutrition education and training, and value chain and market development. Pulses such as beans, peas and chickpeas are prized for their nutritional content as well as their ability to fix nitrogen from the air to enrich soils. The event is underway today in Marquis Hall at the U of S with talks on history, successes and the way forward by researchers working on the project. University leadership and government representatives from both countries will also be on hand, emphasizing the broad network of partners needed to create and implement an international program. The scale of that change is ambitious: to provide hundreds of thousands of farm families with seeds and know-how to grow pulse crops such as beans and chickpeas, plus recipes on how to prepare them for maximum nutrition. Ethiopia’s 104 million people live in a country about 70 per cent larger than Saskatchewan. Incomes are low, communications limited and 32 different ecological regions mean many different seed varieties and growing practices needed to be developed. “Certainly it has taken many hands to bring the benefits of these crops to so many people, to mothers and children,” said principal investigator Carol Henry, assistant dean of nutrition and dietetics at the U of S, noting that more than 50 per cent of Ethiopian farmers are women. Henry said that long-term funding from Global Affairs Canada and Canada’s International Development Research Centre, in particular, has been crucial to the success of the project. “To create systemic change takes time and that takes consistent, long-term funding,” she said. Beyene explained that universities are good at doing research, in this case aimed at tackling the daunting problem of malnutrition in Ethiopia. Public-private partnerships have made the difference in reaching thousands of rural farmers and their households, including children. While the country’s fortunes have improved in recent years—according to the World Bank—Beyene said about 40 per cent of children still suffer stunted growth due to inadequate nutrition. At the root of the problem is lack of affordable protein and deficiencies in nutrients such as zinc and iron. Pulse crops are well known for their protein content and there is a window of time to grow these crops after the harvest of farmers’ main cereal crops, using residual soil moisture. Over the years, the researchers developed water-efficient, short-season pulse crops to fit into this niche. A variety of chickpea was developed that concentrates zinc in its seed and a type of Rhizobium bacteria was isolated that helps the legumes fix nitrogen from the air. As part of the package, the research team pulled in collaborators to develop recipes and preparation techniques such as fermentation and sprouting to make nutrients easier to absorb, which is particularly important for young children. This information was shared with the farmers. Markets were developed to add value to the harvest, and income to farmers’ pockets. More information on the U of S-Hawassa partnership and a live stream of the event are available at www.theplusesofpulses.com or follow @plusesofpulses on Twitter.